Submitted by MANNA on January 20, 2015 – 12:20pm. I would like to thank everyone here on TFL, thank you. Everyone supports everybody else and always lends a hand or gives advice freely and without criticism. 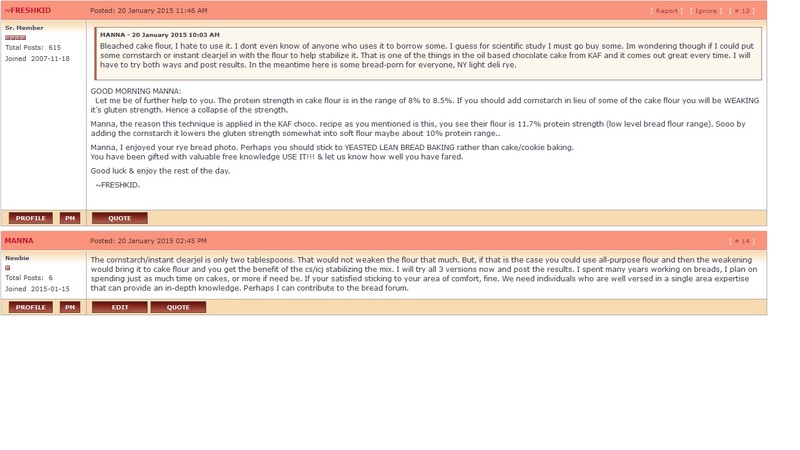 Earlier this week I joined another forum looking to perfect my cake baking. And the senior contributors that rule that roost are not very nice. I feel my journey to making the perfect cake is worthwhile information for anyone wanting to figure out what went wrong with their own cake baking experience. So, I will continue and keep posting there until my journey is complete and then move on.Here is a screen shot of what I mean and why TFL is the best on the web. It is not just one thing that makes TFL great, it is Floyd and all the members doing there small part to collectively make it great.